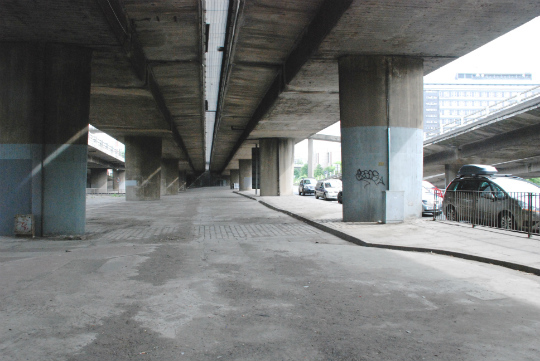 Under the M8, outside Anderston Station. Kevin Murray Associates were part of a team, led by Hypostyle Architects, commissioned by Scottish Enterprise and Glasgow City Council to produce a development framework for Glasgow’s City Centre West. The study area is a large part of the western city centre, running from Central Station to the M8, and from the Broomielaw north as far as Sauchiehall Street. KMA provided planning policy analysis, advice on strategic policy direction, placemaking as well as facilitating two key stakeholder workshops. The study examined exemplars of successful business districts in other European cities to cross-examine the policy direction for the area and consider how it could be adapted to enable a vibrant and competitive business district. The area falls within the city’s principle office area in terms of planning policy. While this has been successfully resulted in several major commercial developments these have under-active ground floors, leaving the place desolate, especially outside business hours. The study recognised that the most competitive business districts have a fine grain of uses integrated into the commercial office environment – therefore a primary recommendation coming out of the study was to stimulate more human activity and a better sense of safety by ensuring that existing and future developments have ground floor uses that contribute activity to the streets and a much finer grain of uses, including some residential and retail, to create a more dynamic place that people want to visit. Another key element was considering how the development framework could facilitate the greater activation of the Clyde waterfront. This is a highly under-used area, despite the considerable investment in public realm. Ideas that were proposed included floating barges, housing restaurants, offices, leisure uses and even a barrage to raise the water level enabling a greater degree of interaction between people on the river bank and the water. The study identified that critical early investments are required around much improved walking and cycling networks, including a major upgrade around Anderston Station, to connect the area both back into the city centre, and also west towards the regenerating Finnieston area. Being able to move more continuously across the M8 corridor would further enhance the area.